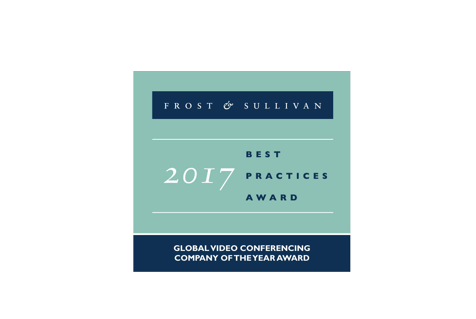 Today we announced that Zoom has been named 2017 Company of the Year in the Video Conferencing Industry by Frost & Sullivan. Frost & Sullivan’s global team of analysts and consultants continuously research a wide range of markets across multiple industries and regions. As part of its ongoing research, the firm identifies companies that are true industry trailblazers, delivering best practices in growth, innovation, and leadership. Frost & Sullivan recognizes Zoom as the video conferencing industry leader across 10 criteria: compelling user experience, strong performance metrics, rapid pace of innovation, innovative marketing, smart workflow integration, price/performance value, customer purchase experience, customer ownership experience, customer service experience, and brand equity. In discussing Zoom’s rapid pace of innovation, for example, Frost & Sullivan noted, “With innovation in its DNA, the Zoom team has stayed on a rapid product development track. Zoom continues to focus on building leading-edge features and functionality in its platform.” The report also compares Zoom to two competitors across these criteria. To read Frost & Sullivan’s in-depth analysis across the criteria discussed above, download the full report here.